Exactly 20 years ago Nike presented the world with their first football boot silo, the Tiempo, at the World Cup in America. 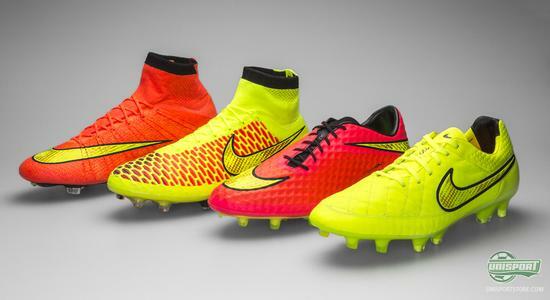 This summer it is time for yet another World Cup, this time in Brazil and the Tiempo-collection lives on full of vigour. 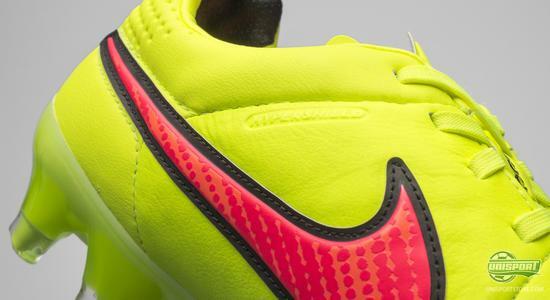 In connection with the launch of Nike’s World Cup-collection, the latest generation of Tiempo Legend has been given a lively colour update, just like its brothers. 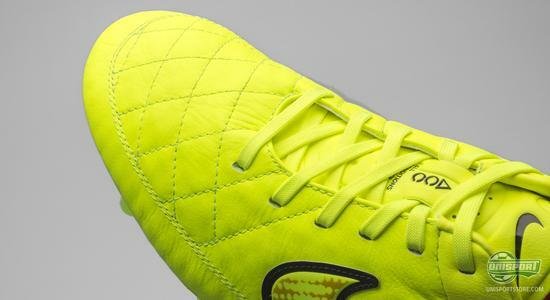 The Tiempo-collection may have 20 years behind it, but just because the Tiempo Legend V represents an old-collection, it does not have to be boring. Nike’s latest boot with a leather upper, has been given a flashy makeover fitting of Nike’s World Cup-collection, which features the Magista Obra Volt/Metallic Gold Coin/Black, Hypervenom Bright Crimson/Volt/Black and Mercurial Superfly IV. 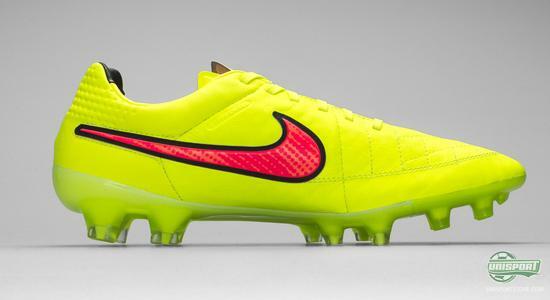 Pre-order the new Nike Tiempo Legend V Volt/Hyper Punch/Black here - just €166. Nike’s Tiempo Legend V has ball feel of the highest order and it is therefore no wonder that the Italian wizard, Andrea Pirlo, is one of the stars, who uses the Tiempo as his weapon of choice. It is particularly the boots upper that stands out, as it is made from a soft and supple piece of kangaroo leather. 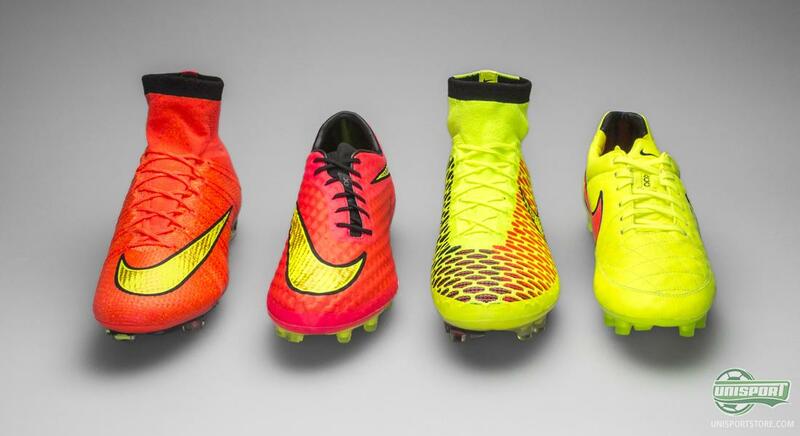 To strengthen the boots stability and durability, Nike have chosen to make the back part of the hell with Kanga-Lite, which is a synthetic material that emulates the qualities of leather. 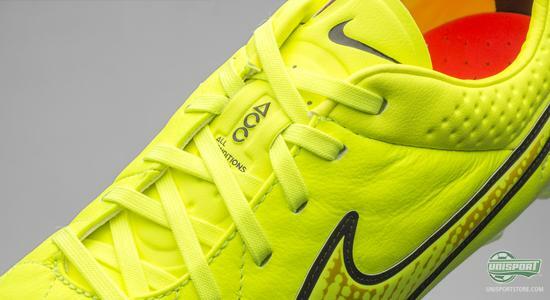 Just like every Nike football boot, the Tiempo Legend V is naturally also made with their innovative ACC (All Conditions Control) incorporated into the upper. 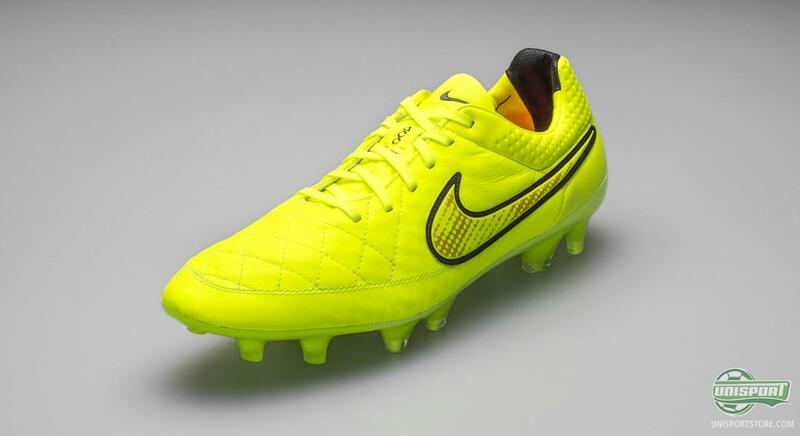 Unique for this particular model is that the boot has been made with the Hypershield-technology, which Nike have developed specifically for their leather boot. 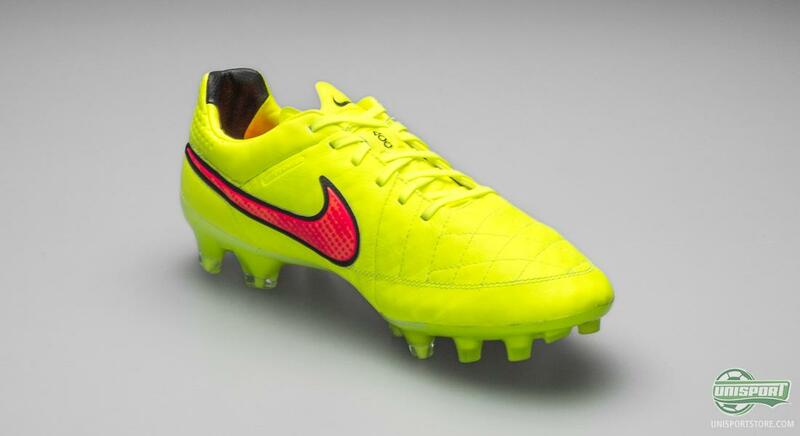 Leather has a tendency to take in a water, but by covering the leather in this technology, Nike ensure that the Tiempo stays light and elegant, even in rainy conditions. 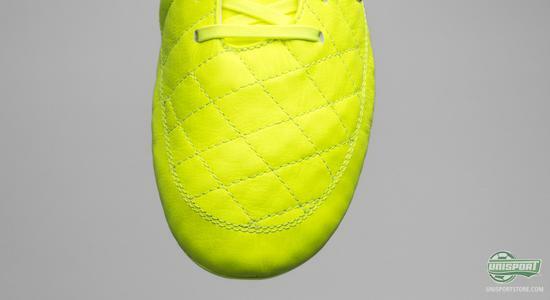 Nike like to fetch inspiration from their running shoes, when they develop their football boots and the Nike Tiempo Legend V has in this connection borrow ideas from the Nike Free-collection. Just like the famous running shoe, the Tiempo-sole is made from a TPU that provides extraordinarily good flexibility and movability. This combined with the soft upper, makes for a very comfortable football boot. 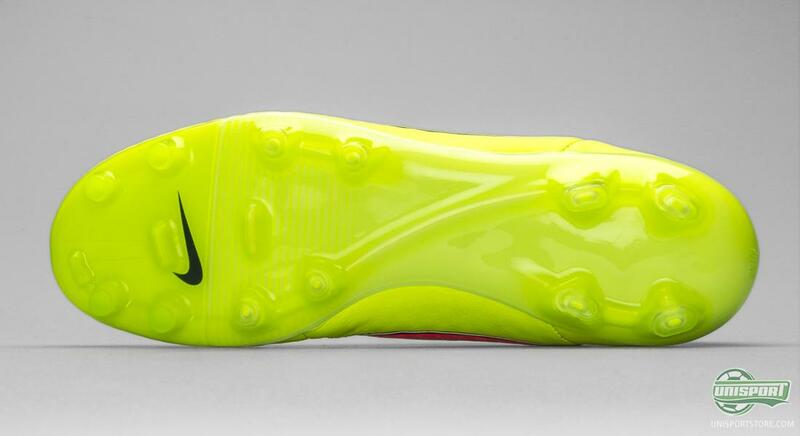 With the stud-configuration Nike have chosen to mix conical studs on the front, with bladed studs on the back. The round studs give better rotation and distribution of pressure, while the studs on the back provide excellent stability. 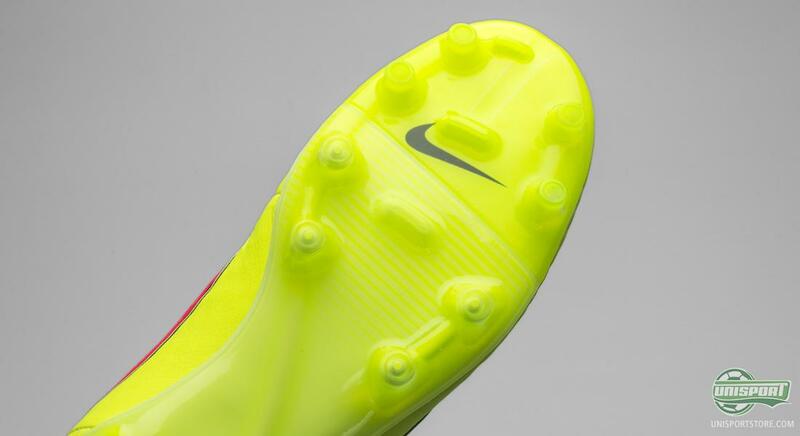 At the same time the studs have collectively become a little wider, which makes for a generally improved grip. 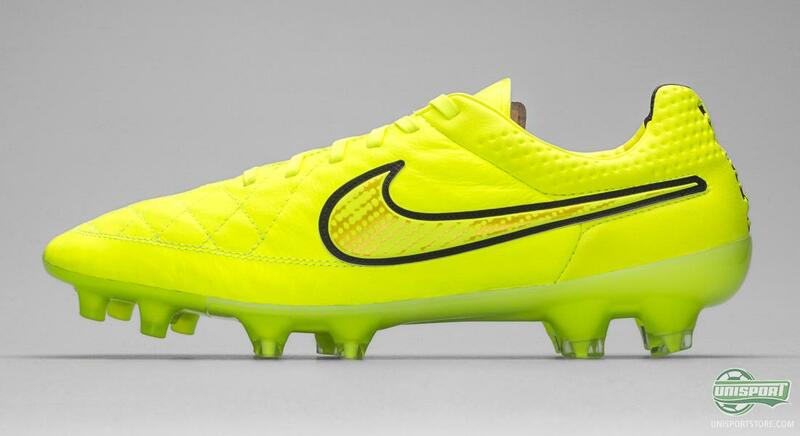 The Tiempo-collection is the epitome of a classic football boot, but with the fifth generation, Nike really manage to combine the classic with the modern. 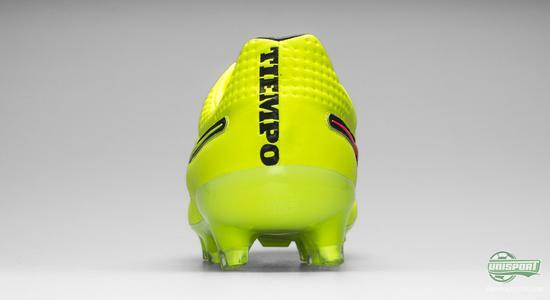 The technological aspect is certainly achieved with the Tiempo Legend V and with the daring design the boot is sure to be a hit among many footballers. Tiempo Legend V is a boot loved by many, because it combines both history and future in one, something very few boots manage. This World Cup edition really embraces the modern design and Nike’s eagerness to always do the unexpectedly brilliant. We are not a second in doubt that the new colourway will shine during this year’s World Cup in Brazil. What do you think about the colour choice? Brave or just a tad too much?